Formula 1 rolls into the Black Sea resort of Sochi for the Russian Grand Prix this weekend. Here are 10 things to look out for – on and off the track. Although the season is only three races old, it’s already shaping up to be an intriguing battle between two multiple world champions. German Sebastian Vettel is enjoying life in a revived Ferrari car, with the four-time world champion winning the season opener in Australia and the last grand prix in Bahrain. Sandwiched between those wins was Lewis Hamilton’s victory in China, with the three-time world champion coming second in Melbourne and Bahrain. Sochi is likely to be the latest chapter in this season’s emerging battle between two racing greats. Integral to Vettel’s early-season success is, of course, the long-awaited revival of Ferrari. After not winning a race last season, Vettel now leads this year’s drivers’ championship by seven points. Design changes for 2017 have helped Ferrari, with innovations to the front of the car and the engine giving them a power unit “as good, if not better, than Mercedes’,”according to some in the paddock. Sochi can look forward to that rarest of sights in recent years – a Ferrari team fired up and on form. 3. Will Mercedes respond to Hamilton’s call? Hamilton was quick to apologize for the time penalty that arguably cost him victory in Bahrain, although he also called on his team to combat the challenge from a revived Ferrari. Sochi will see whether Mercedes can rise to that challenge. 4. Can others make a statement? Mercedes man Valteri Bottas claimed pole in Bahrain – a sign that he could be the one to break the nascent Hamilton-Vettel title battle. Bottas is new to Mercedes, having taken up the seat vacated by Nico Rosberg after he retired following last season’s maiden title victory. The Finn has the talent to trouble his more vaunted rivals, and his flying pole in Bahrain could be a sign he’s finding his feet with his new team. Others will be looking to make a mark, including Red Bull’s teen sensation Max Verstappen. Teammate Daniel Ricciardo will also be looking to add to his four Grand Prix career wins. If anyone is going to challenge serial title winners Hamilton and Vettel, Sochi would be a good place to start. 5. Hamilton to revive Sochi hot streak? Hamilton-Hamilton-Rosberg – so reads the list of winners of the three Sochi Grands Prix since F1 came to Russia. A Hamilton hat-trick was foiled by his Mercedes teammate Rosberg in 2016, but with the German absent this season, no other rider in the pack has enjoyed soaking up the Black Sea sun as much as the Brit. The 32-year-old will be hoping that winning experience gives him an edge this weekend. 6. Home comforts for Kvyat? Russian driver Daniil Kvyat is in danger of seeing his early promise peter out, having been moved from Red Bull to Torro Rosso to make way for teen star Max Verstappen – a step that many saw as a demotion. Last year’s Sochi race saw Kvyat’s emotions get the better of him as he powered into the back of Vettel on the first lap, causing the German to spin into the wall, ending his race. That drew an expletive-filled rant from Vettel, and Kvyat will want to better control his passion this time round and give the home fans something to cheer about. “This is always a special weekend for me as it's my home race. I've had very good qualifyings there but I've never actually been able to put the perfect race together in Russia, so I'd like to achieve it this year,” he told formula1.com. 7. Latest installment in Alonso-McLaren tensions? Spaniard Fernando Alonso has become increasingly frustrated at the inability of McLaren-Honda to challenge their rivals on the track. The 35-year-old double world champion snapped at his team in Bahrain, saying over the team radio "I have never raced with less power in my life," and replying "do whatever you want" when asked by team about tyre strategy. McLaren’s decision to allow Alonso to skip Monaco to race in the Indy 500 may have eased tensions, but any problems in Sochi could spark another very public episode in the soap opera sideshow between the Spaniard and his team. Sochi’s 5.48km track is one of F1’s fastest, and with the Russian Grand Prix now three years old, the track has had a chance to “settle,” according to Red Bull driver Daniel Ricciardo. “It’s a bit like Austin (US) in the first few years, when it took a while to bed in. But I expect this year for the track to be grippy and with these cars it should be quite fast,” he told formula1.com. Teammate Max Verstappen also praised the track as “special,” with the Olympic Park adding a “special atmosphere” to the race. “It’s quite a flat track and not a lot of elevation changes and some difficult braking zones. It’s always challenging to come from high speed into a low-speed corner and achieve the best out of it in braking. I’m definitely looking forward to go back there and have a good race,” Verstappen added. Sochi will further cement its place in the F1 calendar this weekend. Since F1 came to Russia it's gone from strength to strength in the country, with crowds of around 65,000 filling the Sochi stands for previous Russian Grands Prix, and more bumper turnouts expected this weekend. F1 is known to attract its fair share of celebrity followers, and Sochi should be no exception. Most of the stars will be better known to the Russian audience – rapper Timati was a past visitor, as was singer Valeriya – but keep an eye out trackside for plenty of political figures and also the likes of Steven Seagal. The Hollywood actor has visited Sochi in past years. The forecast is for largely sunny skies this weekend and temperatures of around 20C (68F), which will add to the atmosphere trackside. 10. Will Putin get splashed again? Last but not least, the all-important question: will Russian President Vladimir Putin get caught up in the champagne celebrations again this year? Back in 2015, Lewis Hamilton’s exuberant podium celebrations extended to splashing the Russian leader with bubbly as he made his way off the presentation stand. 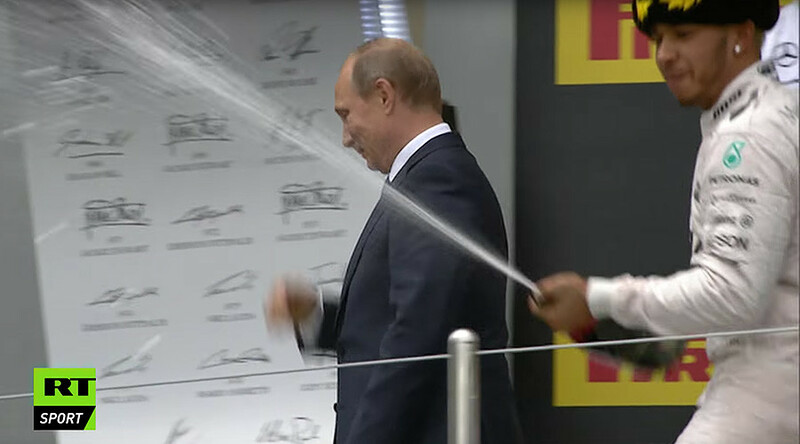 All the racers on the grid would love the chance to splash the bubbly this time around, while the Russian leader will hope to avoid any unnecessary dry-cleaning bills.